The lathe is the heart of any clockmaker's shop. It is used for turning and milling gears and many other small parts. The Rounding Up Tool is traditionally used by watchmakers and clockmakers to size and shape the individual teeth of very small gears. All different shapes, sizes and cuts of files are used for finish and detail work. The depthing tool is a highly accurate instrument used to align and lay out the position and distance of two gears. These tools are vital for many different applications in the assembly and disassembly process. 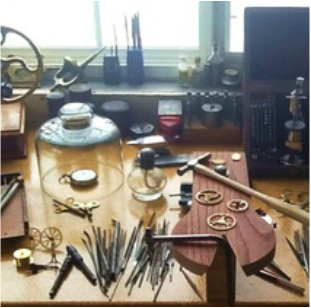 Various sizes of jewelers' saws are used for cutting the fine fretwork into brass and steel such as cutting clock plates and crossing out gear spokes. These smaller lathes are useful for countless small tasks including pivoting, burnishing and small diameter turning. The treadle saw is a novel old tool that is not commonly used today but can be used for cutting brass clock plates.